We became huge fan of RoomMates Décor Peel and Stick Wallpaper last year after using their wallpaper in two rooms of our home. So naturally when their peel and stick tiles became available I knew I wanted to give them a try and I always love to think outside the box. 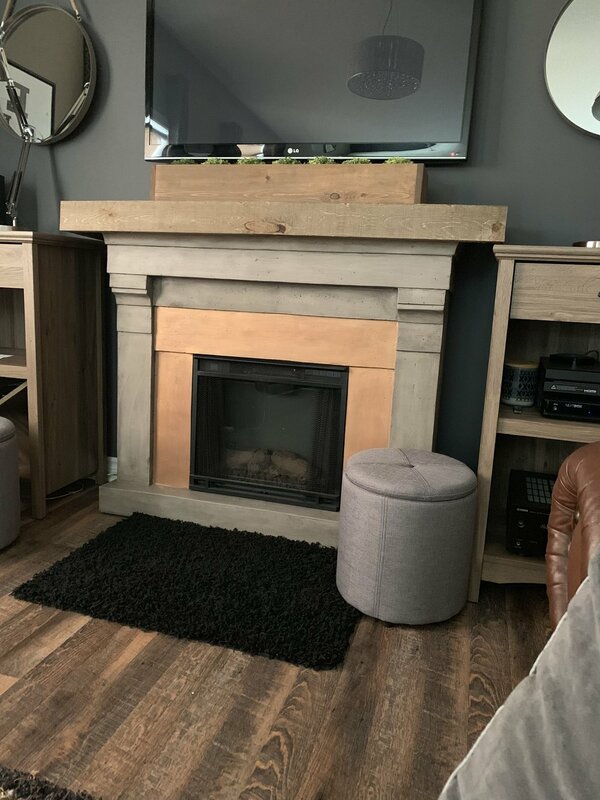 Not one to be deterred, I got to work and did a little research and found that the tiles would be ok to use on this particular fireplace because there are no “open flames”. It is an electric fireplace so it doesn’t get as hot as a gas or wood burning fireplace would. I did decide we should use an added adhesive, just to be on the safe side, and one that was heat/temperature resistant. I highly recommend this step if you are looking to use these tiles in a similar manner. To prepare the fireplace for installing the peel and stick tiles I gave the area a light sand with 120 grit sandpaper and then wiped it down with TSP to ensure it was clean and dust free. We did all of the measurements and cutting of the tiles before we started applying the glue. We made sure they all “fit” together as they should and the “grout lines” all lined up. We used a metal ruler and a utility knife to cut them but you could also use scissors. A utility knife or box cutter with a ruler just ensures a straighter cut. Once the pieces were all cut, the process of adhering the tiles was simple, even with the added adhesive. You have about 5 minutes to move them around if you need to. We chose Gorilla Glue Construction Adhesive as our added adhesive because this particular one is not only temperature resistant; it is very thick, similar to Spackle or Dap. I applied it with a plastic scraper directly to the fireplace, and it literally “filled in” the small areas that weren’t perfectly smooth on the concrete surface.. The pattern and style choices available on the RoomMates website make it very hard to choose! Ultimately we ended up picking the “White Marble Hexagon” tiles. the grout lines were the perfect shade to tone in with our concrete fireplace. These Peel and Stick Tilescome in a package of four 10x10 sheets. We used two packages for this project and have some scraps leftover. I am hanging onto them because they would be great on a serving tray or in a picture frame one day when I am bored and looking for a quick DIY! Two thumbs up for these Peel and Stick Tiles. If you have been thinking about a new backsplash but don’t have the skills, tools or the budget, these are exactly what you are looking for! They not only make for an easy and affordable DIY, they are very user friendly so don’t be afraid to give them a try. If we can do it, so can you! PS….MOST OF THE PEEL AND STICK TILE COLLECTION IS CURRENTLY ON SALE FOR $9.99!!! CLICK HERE TO CHECK THEM OUT!! !